Marjoram Leaf, an aromatic tonic in the mint family which originated in Egypt and India. The aromatic qualities means that it good digestion, and is believed to be a wonderful remedy for colic, eliminating flatulence, sour stomach and stomach pains. It is also an effective expectorant that loosens phlegm in the lungs and alleviates sinus headache, bronchitis, dry coughs and the symptoms of colds and flu. Marjoram is also a natural disinfectant, anti-inflammatory, antifungal and antioxidant that effectively relieves pains and aches. Studies show that another benefit of Marjoram leaf extract is for lowering blood pressure, greatly reducing the risk of hypertension, which results in heart problems. It also helps to prevent the build up of cholesterol, and that may help to reduce the risk of hardened arteries. 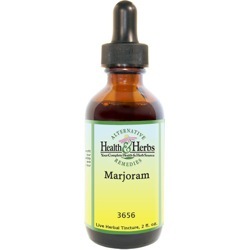 With sedative and antidepressant qualities, Marjoram has a variety of psychological and neurological benefits. It is believed to aid in relieving insomnia, reducing stress, calming anxiety, minimizing emotional reactions, and decreasing sexual desire. When applied topically it may help to heal wounds, bruising, insect bites and itch, and help in the treatment of chilblains. Marjoram Leaf can promote the flow of urine, helping to relieve stomach bloating and clearing the body of toxins, cleansing the blood, and is beneficial in treating eruptive diseases and skin disorders, particularly eczema. Current research shows that Marjoram demonstrates noteworthy antioxidant activity, helping to prevent free radical damage, thereby reducing the risk of cancer and atherosclerosis. This is particularly attributed to the herb's content of rosmarinic acid, a polyphenol valued for the antimicrobial, anti-inflammatory and anticarcinogenic effects. Rosmarinic acid has demonstrated superior antioxidant activity and has been compared to that of vitamin E3, which is currently used in the treatment of cataract cancer. Marjoram leaf also contains vitamin A and betacarotene, cryptoxanthin, lutein and zeaxanthin, which are all powerful flavonoid anti-oxidants. Together these compounds play a big role in anti-aging and various disease processes. They are also very important to healthy eye-sight and maintaining healthy skin. The properties have also been found to have a beneficial action against age-related macular disease (ARMD), especially in the elderly. Sweet Marjoram is also one of the richest sources of vitamin K which has a potential role in bone mass building, by promoting osteotropic activity in the bones. It also has a role in the treatment of Alzheimer's disease by limiting neurological damage in the brain. Marjoram leaf also contains a good amount of minerals like iron, magnesium copper, zinc, manganese, calcium, and potassium. Potassium is very important as a component of cell and body fluids which helps control heart rate and blood pressure. Lab tests claim that it prevents cholesterol buildup and improves blood circulation. This herb promotes healthy digestion and treats simple gastrointestinal disorders, such as indigestion, nausea, and flatulence. It is said to act like peppermint in the way it soothes minor digestive upsets and colic. Marjoram leaf extracts can help digestion in a number of ways. First, it increases the digestive enzymes and saliva, calming the digestive system. It also helps to improve the appetite and fights against food-poisoning. A mild tonic for the nervous system, it is thought to be more relaxing than Oregano, and it is used to soothe the nerves, reduce tension and mitigate stress, especially environmental stress. The sedative qualities help to relieve insomnia, tension headaches, and migraines.Its sedative effects are also believed to be beneficial for snoring. It is considered to be an anti-aphrodisiac, and beneficial for those who are suffering from abnormal sexual urges. When used externally, it eases toothache pain, rheumatic pain, muscular pain, arthritis, sprains, stiff and paralytic limbs. It is a natural disinfectant, antiseptic, antifungal and antibacterial that has healing qualities and combats infection. It has been used to help heal wounds and prevent scarring. It has also been used in the treatment of bruises as well as for toothache pain. Apart from the many benefits given to Marjoram leaf tincture, covering almost every aspect of good health, it's also commonly used in beauty and hair products. Ingredients: Marjoram Leaf, Structured Water and 20% Alcohol. Non-Alcohol: Marjoram Leaf , Structured Water, Vegetable Glycerin. Contraindications: Pregnant and nursing women should not use Marjoram Leaf. Those who are allergic to members of the mint family (thyme, basil, sage, oregano, lavender, hyssop, etc.) should avoid this herb.